YAIAA divisional play gets started this week, and this week's guest picker knows a thing or two about winning division games. Former West York coach Ron Miller, who went 47-4 against divisional opponents and won seven division titles in nine years, will compete against the GameTimePA staff in picking the winners of every game this week. We'll see if his winning percentage can come close to the 86-25 overall record he posted with the Bulldogs before stepping down in 2014. 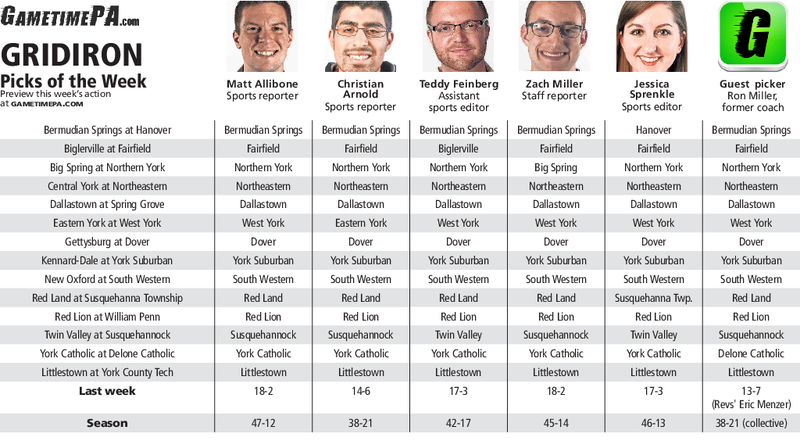 The guest pickers could really use a boost after York Revolution President Eric Menzer went 13-7 last week to drop the guest pickers into a tie for last place on the season with GameTimePA staffer Christian Arnold. Miller did indeed pick West York to top Eastern York in a battle of winless teams on Friday. Most of his picks match up with the GameTimePA staff consensus, but he did go against the grain by picking Delone Catholic to top York Catholic. Click here to preview all of the Week 4 games.